I have had this product for while, but have recently tried it. I know that there are plenty of reviews for this out there, but I want to give a review from the perspective of someone that has eczema. And I must say that I am not a huge fan. Lets start with the pros. 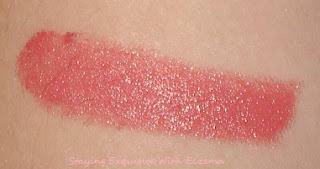 The pigment of this lip stick is great and it does not take much to saturate your lips with color. It feels smooth upon application and the color stays on a long time. The color of Heavenly is gorgeous. It is a coral-y pink and is nice for this time of year. Now for the cons. It applied smoothly, but it did not feel the least bit moisturizing. It even went so far as to accentuate any dryness on my lips. 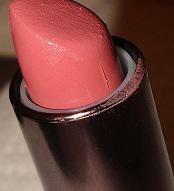 The color did last, but it eventually looked more like a stain and the residual color was much more of a coral. I wore this yesterday and my lips still feel dry. And it also smells like Play-Doh. Luckily the scent does not hang around long. If you have dry, eczema prone lips, I would say to stay away from this. In the first picture, you can see the piece of dry skin and how some of the lines are accentuated. I'm not even sure I knew that I had them, lol.